This week I happen to be traveling all across Tennessee for a work-related project. Myself and two UT professors, Dr. Mark Burton and Dr. Larry Bray, have been driving around Tennessee in order to collect data for a planning/economics research study being developed. We've specifically visited 19 counties, and in the process have driven just about every corner in Tennessee. I of course brought my camera along, and while there is no way I can possibly cover every place we visited, I'd at least like to hit some of the highlights from each day. From Nashville, we started West on I-40 and exited the Interstate at US 641 just past the Tennessee River and drove through Camden until we reached Paris, TN. 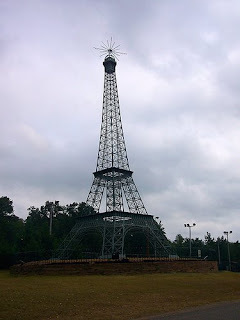 In Paris, I had to stop off at Memorial Park and see the famed Eiffel Tower replica. (It was constructed in 1991 I believe) After taking a couple of snapshots, we continued west on State Route 54 and drove on to Reelfoot Lake/Tiptonville. 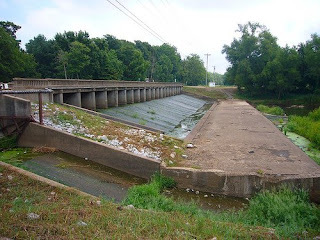 When we reached Reelfoot Lake, Dr. Bray (who recently retired from TVA) told me to pull over and check out the Reelfoot Spillway located on State Route 22/21. 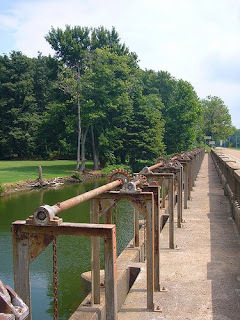 The spillway was built in 1931 and controls water levels for Reelfoot Lake. TDOT just recently obtained permits to build a new spillway about a 100o ft. upstream since the old spillway is deteriorating and has outlived its design life. I'm not sure what will happen with the historic spillway, but I hope the community steps up and preserves its past by at least documenting its existence through photos and oral histories. After leaving Reelfoot Lake, we drove back down to Southwest Tennessee before heading to our hotel rooms at the luxurious LaQuinta in Jackson. (I joke because its the only hotel in Jackson that takes state govt. rate, but I can't knock it too much because I slept great that night.) Unfortunately, on the way there we encountered torrential downpours (the remnants of Hurricane Faye) and since I'm the only one authorized to drive the state car, it fell upon me to drive us through the mess. I'll post about Days 2,3,4, and 5 of my trek across Tennessee when I get back into town. I'm in Atlanta right now with my fiance's family and plan on driving to NC on Labor Day in order to raft the Nantahala. I'm always on the go. Don't worry, I also frequently cuss your employer when trying to navigate unfamiliar territory. Our state signing system is crap.